Approximately 160 kilometres north of Melbourne near the town of Rushworth you will find the township of Whroo. The township is a historic gold mining town that in it heyday was the home to many thousands of miners. Today it is a virtual “ghost town”. By 1850 the area around Whroo was extensively settled by pastoralists and the discovery of gold in 1853, the township of Whroo was established. The township and area grew quickly, and just as quickly died away. The last resident of the town left in the early 1960s. The township and area had a cemetery of five acres gazetted on 21 August, 1860. 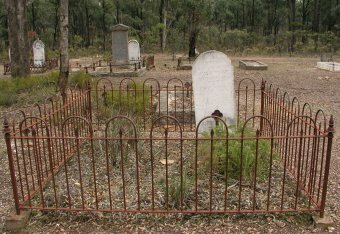 The cemetery is still in the area today and is located on a hillside off the Murchison to Whroo Road. An unnamed track runs into the cemetery from this road. It is reported that the cemetery contains approximately 400 graves. Today all that remains are a small number of identified graves, with many of these containing headstones. The area of the cemetery is cleared and maintained. In his letter to the Crown Lands Commission on 18 June, 1860, Arthur Henry Haines noted the following number of various religious denominations at Whroo: 130 Church of England (all ages) 100 Presbyterian (all ages) 80 Catholic (all ages) 50 Independent (all ages) 30 Wesleyan/Methodist, and Approximately 200 Chinese. In 1913 the Trustees were: Charles E. Band (Presbyterian), James Pettifer (Church of England), John LeRoy (Methodist) and John Birney (Church of England). Alexander Darroch, who had been a Trustee had passed away by the time the June, 1913 return was forwarded to Public Health Department in Melbourne. In May, 1970 in a letter sent to the secretary of the Commission of Public Health it was noted that there had been approximately 344 burials in the cemetery since it was established in 1860 with the last two burials being between 1965 and 1969. It also noted that the Commission of Public Health recommended to the Governor in Council that the Council of the Shire of Waranga be appointed as Trustees for the cemetery following a request from the Trustees that they no longer wished to serve. In the Government Gazette of 17 June, 1970 it was listed on page 2069 that the Governor In Council had approved this request. 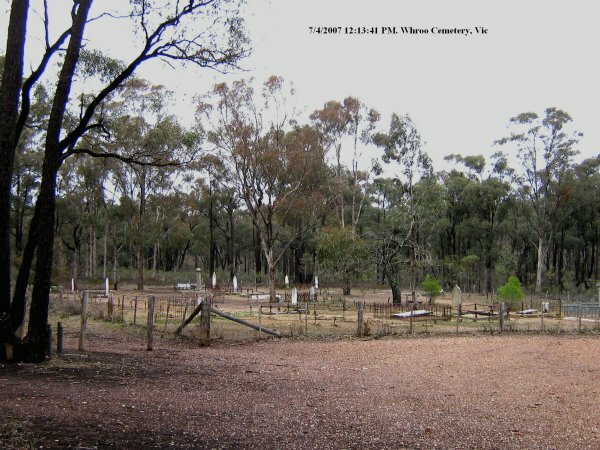 In June, 1983 a report on the Whroo Cemetery was prepared by John Kirby, Landscape Architect, for the Shire of Waranga. It made a number of recommendations in regards to the historic cemetery. Following the publication of the report, the Shire of Waranga in a letter to the Health Commission of Victoria in August, 1983 requested funds to undertake many of the recommendations in the report. The Genealogical Society of Victoria holds in its files of Victorian cemeteries a list of interments: Headstones- 22 May 1862 to February 1996 and Burial Register – 1858 to 1996. 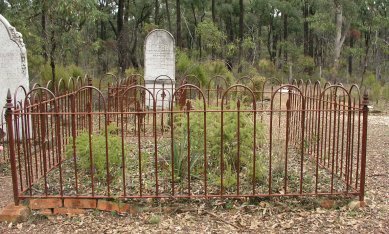 There is also a Whroo Website that provides information on the old township and a list of Cemetery Headstone Transcriptions. The first recorded burial is listed for William Huggins, aged 53 years, who was buried 24 May, 1859. One of the earlier headstones still standing is for John Welch who died at Whroo aged 57 years, on 8 May, 1879. Also buried in the cemetery is Frederick LeRoy, aged 17 years and listed as a miner. He died on 24 January, 1876 and was buried 27 January, 1876. His parents were Alfred LeRoy and Maria Ann Hamon. John LeRoy, along with his wife, Mary Tamar LeRoy, were buried in the cemetery. He died in September, 1953, aged 84 years; she died in April 1971, aged 89 years. One of the headstones laying down on the top of the grave is for Gilbert John Cochrane who died 11 March 1895, aged 18 years and 9 months. The headstone also lists Donald Cochrane (August 18, 1898) and Susan Charlotte Cochrane (April 24, 1933), parents of Gilbert. Also for Nellie Catherine Cochrane, daughter of Donald and Susan Cochrane who died 9 February, 1974, aged 90 years. There are number of Chinese graves in the cemetery. 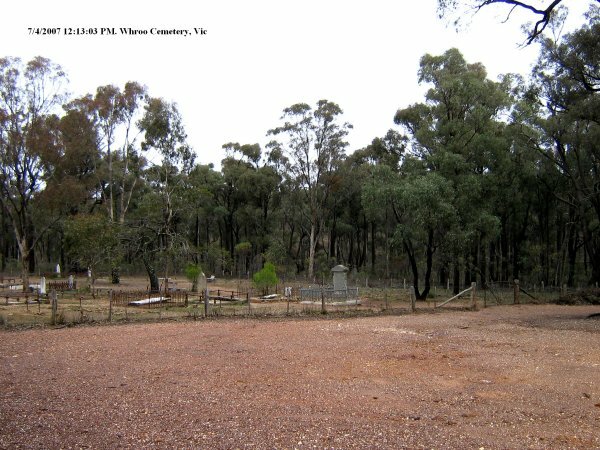 Currently the cemetery is administered by the Campaspe Shire Cemetery Trust, Rushworth Office. There is a small archive file on the cemetery in the Dept of Human Services, Cemeteries Unit that dates from 1860. It is an interesting old, historic cemetery.